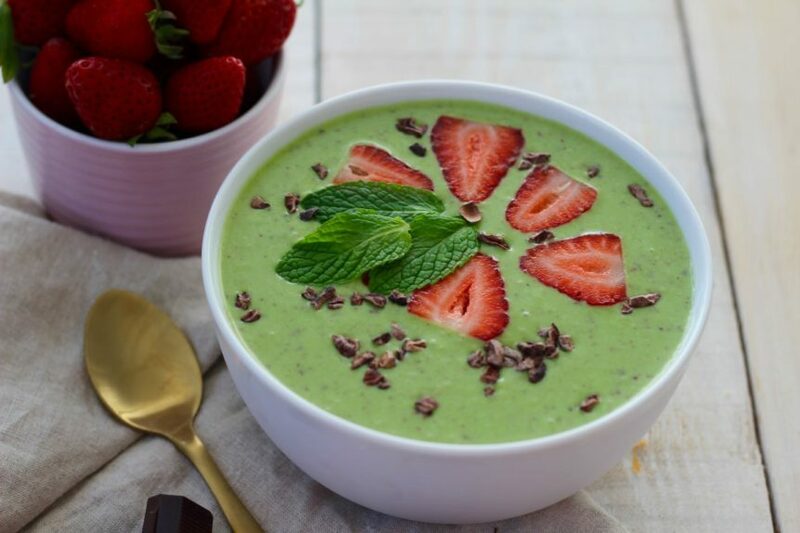 Choc Mint Smoothie Bowl with Spinach and Fresh Mint. Oh gosh. This Choc Mint Smoothie Bowl is about to rock your world (well at least the world of your taste buds!). Ahhhh! It is all kinds of drool worthy epic. Not only yummy but it’s got spinach and fresh mint in it, so it is 100% good for you too! Boom. This recipe is from the Volume 7 meal plan. Did you guys know we have recipes in meal plans available for you to download? They’re all 7 day meal plans to get you organised in minutes and feeling way better in 7 days. You might think that it’s a big call… but seriously… as soon as you have a couple days of good, real food eating in a row you just feel better. And freaking YAY to feeling better. Get all the info on the meal plans HERE, there are 7 available right now! That’s 49 breakfast recipes, 49 dinner recipes and 7 EPIC sweet treats! Plus shopping lists and prep ideas. Oh, how good does organised feel!? Ok back to the Choc Mint Smoothie Bowl recipe. The colour is some kind of magical green and we even reckon the kiddies are gonna love this healthy smoothie! Fun and yum! It’s a smoothie and smoothies always win for the quickie factor. Chuck stuff in blender, whiz! Drink! Ahhh. Talk about easy, peasy! If you make it, let us know! Share your pics with us, we love seeing them! Makes us extra merry and smile huge. P.s don’t forget to checkout the healthy and very merry 7 day meal plans! Chuck all the ingredients into the blender, except the cacao nibs/chocolate and whiz until nice and smooth. Pop the chocolate into the blender and whiz again. Be sure to add any extra super dooper foods like gelatin, turmeric, maca, cinnamon… whatever you want! Add half an avocado for creamy factor!